When I was in college, I worked at a bakery called the Upper Crust. They made the most beautiful desserts, cookies, cakes and breads - most from scratch. One of their most popular items were these small bite-size cream puffs with chocolate fudge buttercream. Ladies would come in a buy trays full for parties, then have a couple boxed up for the car ride home. People were addicted! The real secret was... the cream puffs were frozen! That's right. They bought them from Costco, then added their own delicious buttercream on top. 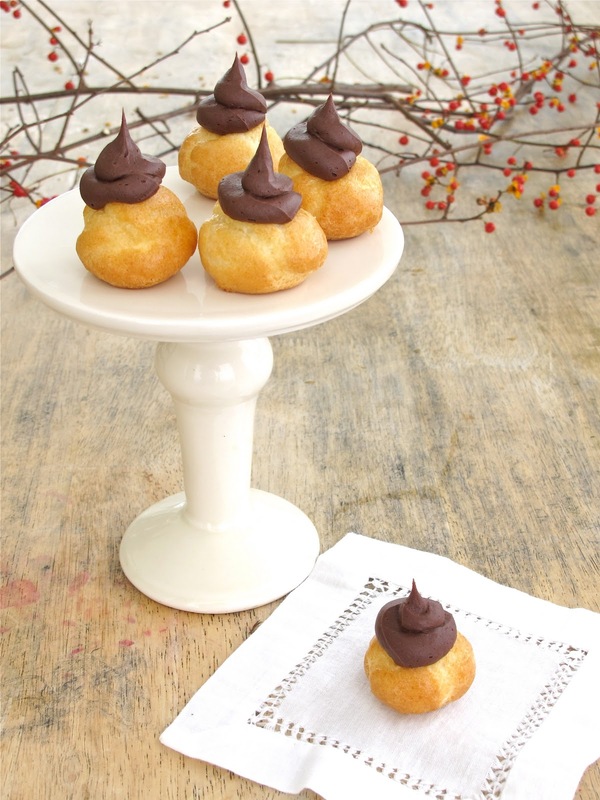 When I started catering, these cream puffs were my secret weapon. I could turn out 100 in 10 minutes for $15... and my clients loved them - always at the top of the request list. Thaw the cream puffs for about an hour at room temperature or a couple of hours in the refrigerator. Put the chocolate butter cream in a plastic pastry bag. Cut the tip off, leaving about a 1/2 inch opening. Pipe the buttercream on the puffs. Jenny these are Adorable. They would be at the top of my list too. Look like topped with hats. I like them stuffed with chicken salad (or turkey salad) too. I'm weak for pastry. Can you make these ahead and keep them in the fridge before serving? Thank you! Asma, Yes you can. Because they come frozen, I would pipe them when they were still frozen the morning of the party, then put them in the refrigerator for the day to thaw. They only keep in the refrigerator for about a day, then the whipped cream filling will make the pastry soggy. Hi Jenny, I just want to thank you for this fudge receipe. The party is still on and guests finished all the puffs. Thats great isnt it? Happy New Year for you and the whole family! One thing that you may like to try on your Belgian waffles is oatmeal. This not only brings a wonderful flavour to your waffle, but also a nice texture that many people like.